Traditionally, the South and Southeast Asia lecture is addressed in the Survey II course after seventeenth-century arts in Europe. I have found that looking at Buddhist icons after lectures on the Renaissance and Baroque is an effective way to underscore the similarities rather than the dissimilarities between two seemingly disparate cultures. The primary thrust of this lecture is the methods through which Buddhism was transmitted throughout Southeast Asia and into the Tibetan Plateau. The material culture of Indian Buddhism played a primary role in the dissemination of Buddhist ideology and practice. The lecture includes material prior to the traditional time period of a Survey II lecture. In order to establish precedence for the creation of large architectural devotional sites, the student will be introduced to Borobudur in Indonesia. As a close analysis exercise to start the lecture, compare the Enlightened Buddha thang ka to Giotto’s murals at the Scrovegni Chapel. Jayavarman VII in Meditation, twelfth–thirteenth century. Denise Leidy, The Art of Buddhism (Shambala, 2008). Meher MacArther, Reading Buddhist Art (Thames and Hudson, 2004). Helen Jessup, Art and Architecture of Cambodia (Thames and Hudson, 2004). Marilyn Rhie and Robert Thurman, Wisdom and Compassion: The Sacred Art of Tibet (Harry N Abrams, 1996). The Rubin Museum of Himalayan Art is an excellent resource and includes links to other sites. The Metropolitan Museum of Art provides information on a former exhibition that explains how Vajrayana (the form of Buddhism in Tibet) ritual practices contributed to reshaping the complex religious landscape of Tibet. The Asia Society is also a good source for Southeast Asia and the Himalayan region. The construction and restoration of Angkor Wat. Key questions for the lecture: How do the objects from Buddhism illustrate the main tenets of the faith for the practitioner? How were they utilized to spread Buddhism throughout Southeast Asia and up into the Tibetan Plateau? What role did the trade routes play in the dissemination of Buddhism and the subsequent evolution of the image of Buddha and the Buddhist deities? How was the visual culture of Buddhism influenced by the native cultures into which it was introduced? For a review of the origins of Buddhism and signs and symbols of the visual culture, please review the Buddhist lecture posted in Survey I lectures. Timeline: c. 800 (Borobudur) to the fourteenth century (Tibetan art and Angkor Thom in Cambodia). Life is suffering (suffering = rebirth). The cause of desire must be overcome. When desire is overcome, there is no more suffering (again, suffering = rebirth). Once Siddhartha achieved Enlightenment and became known as the Buddha he was asked to share his knowledge of the Four Noble Truths with his followers. Thus, these two events in the Buddha’s life are the most represented in the visual culture. Two examples from the Pala Dynasty illustrate these two events: Enlightenment and The First Sermon. The Pala Dynasty (eighth–twelfth century) ushered in a period of stability and prosperity in the Bengal-Bihar region. The name comes from the suffix –pala, which means protector (an honorific name also given to all of its rulers). The Pala Dynasty had trade routes and intellectual contacts throughout Southeast Asia and up into Tibet, resulting in the spread of Buddhism throughout these areas. In addition, Buddhist pilgrims, monks, and students from all over Asia flocked to the holy sites connected with the life of the Buddha and to the numerous Buddhist monasteries and universities. When they returned home, these travelers brought Pala-period Buddhism and art with them in the form of manuscripts, small sculptures, drawings, and other portable imagery. The Palas were the last major Buddhist dynasty to rule in South Asia and were dethroned by the Sena Dynasty (A Hindu Dynasty) beginning in the eleventh century. In the Seated Buddha (Earth Touching Gesture) (late ninth or early tenth century) we see a stele of the Buddha at the moment of Enlightenment. How do we know this is an image of the Buddha? The Buddha’s eyes are half closed and he is seated in lotus position upon a lotus throne. The Buddha’s head has the ushnisha, the cranial bump, and between his eyes is the urna, or third eye. Sculptures like this were placed into niches in the Buddhist temples in order to aid meditational practice. The Buddha resides in the upper portion of a two tiered stele flanked by two attendant figures. He makes the earth touching gesture (mudra) with his right hand that signifies his Enlightenment and his left hand makes a gesture of mediation. All three figures have halos signifying Enlightenment. Above their heads is the canopy of the Bodhi tree under which the Buddha achieved Enlightenment in Bodh Gaya. In the lower portion of the stele, the earthly realm, we see lions (Buddha is from the lion (shakya) clan hence the name of Shakyamuni Buddha). A small figure of a devotee is in the lower right. In the First Sermon, (late tenth or early eleventh century) Buddha is again seated in full lotus on a lotus throne. Here he makes the teaching gesture. This moment is known as turning the wheel of the law (the Buddhist law or dharma), the moment when Buddha sends his teaching of the Four Noble Truths out to his followers. He is again portrayed in the two tiered stele, as was typical of Pala sculpture, with deer depicted in the earthly realm. The deer flank a wheel (cakra) underscoring the gesture that Buddha makes above where he turns the wheel of the law. Buddha’s first sermon took place at Sarnath at Deer Park. The Palas followed the Mahayanist (Greater Vehicle) tradition. The ideology of the Mahayanists is rooted in the teachings of the historical Buddha, but seeks salvation for all beings. This attitude is embodied in the idea of the bodhisattva, whose outstanding quality is compassion. A bodhisattva is an enlightened being who has achieved Buddhahood, but chooses to remain in the temporal world to assist others. The Pala Dynasty produced an abundance of statues and thang kas (cloth paintings) of bodhisattvas. One of the more popular bodhisattva is Avalokiteshvara, the Bodhisattva of Compassion. While many of the statues of the Buddha were made out of the black schist as seen in the two previous images, many of the sculptures of the bodhisattvas were cast in bronze and made to be portable. Visitors to the Pala monasteries would carry them back to their homes to aid new adherents in understanding the Buddhist dharma. Monks would also take them to Tibet in order to spread the dharma and assist with the conversion of Tibetans to Buddhism. Avalokiteshvara (Chenrezig in Tibetan) sits in half-lotus, which is typical for seated bodhisattvas—underscoring that these deities live half in the earthly realm and half in the Enlightened world. He sits on a lotus throne, but has one extended leg so he can quickly rise and come to the aid of a practitioner in need. The Buddha, in contrast, unless he is standing, is always depicted in full lotus. The bodhisattvas also retain the remnants of their worldly possessions and are depicted wearing heavy jewelry and beautiful, ornate clothing. The Buddha is shown with the stretched earlobes that are empty of the royal jewels he renounced when he began his quest for an end to samsara. He also wears a simple monks garment. Buddhists believe that the Buddhas and bodhisattvas reside on Mt. Meru, the sacred mountain considered to be the center of all the physical, metaphysical, and spiritual universes. The image of a mountain figures prominently in Buddhist art and architecture as well as in the ritual practice. Thousands make a pilgrimage to Mt. Kailash in Tibet, following a tradition going back thousands of years. Pilgrims from several religions believe that circumambulating Mount Kailash on foot is a holy ritual that will bring good fortune. Thang kas (cloth paintings) of the Buddha and bodhisattvas, particularly Avalokiteshvara, are hung to aid the pilgrims in their journey. Some believe that the ritual walk around Kailash should be made in a single day, but a person in good shape could take perhaps fifteen hours to complete the fifty-two-kilometer trek. Some of the devout do accomplish this feat: the more arduous the journey—the greater the reward. Many pilgrims attempt a much more demanding regimen, performing body-length prostrations for the entire length of the circumambulation: the pilgrim bends down, kneels, prostrates full-length, makes a mark with his fingers, rises to his knees, prays, and then crawls forward on hands and knees to the mark made by his/her fingers before repeating the process. Doing this requires at least four weeks of physical endurance to perform the circumambulation around the mountain. In 1962, four years before the Cultural Revolution, the Chinese banned all pilgrimage here (although devotees still circled it secretly) and only in 1981 were the first Tibetans and Indians permitted to return. Tibetan Buddhism is known as Vajrayana, the indestructible vehicle (a vajra is a diamond or a thunderbolt). It is also referred to as mantrayana or incantation vehicle. In Vajrayana, the means to Enlightenment is available to all and is expedited through rituals such as the pilgrimage and circumambulation, as well as through the recitation of mantras. Mantras are sacred syllables, words, or group of words believed by some to have psychological and spiritual power when it is audible, visible, or present in thought. Pilgrims chant mantras as they circumambulate Mount Kailash and also may carve them on the rocks. Many pilgrims carry prayer wheels, which contain tiny pieces of paper on which mantras, or blessings, are written. While reciting these mantras as they circumambulate, they spin the prayer wheels to send out thousands more throughout the universe. Monasteries also install large prayer drums for a similar purpose. One of the most popular mantra is the Avalokiteshvara (Chenrezig): om mani padme hum, which means jewel (mani) in the lotus (padme). By the time Vajrayana was adopted by Tibet the ideology had become increasingly complex. Teachers were needed to impart the knowledge of the rituals and texts to their students, who then helped spread the dharma to the lay practitioner. Eventually, in the thankg kas, an image of the teachers (bla ma, pronounced lama) took the central position formerly reserved for the Buddha and the Bodhisattvas. Since the teacher is spreading the dharma, he is depicted similar to that of the Buddha and the First Sermon. He sits in full lotus on a lotus throne, surrounded by his own lineage of teachers as well as by deities that are specific to his teachings. Buddhist architectural structures are human-scale versions of the legendary Mt. Meru. The first example of the phenomenon was the early stupas, which served as burial mounds for the Buddha’s relics—the top was the most sacred space. Practitioners would circumambulate the stupas to gain merit and generate positive karma. Unlike in India (and China, Japan, Tibet, Thailand, and Burma), the stupa was not created as a stand-alone object elsewhere. Smaller stupas were incorporated into the grander architectural schemes in Java and Cambodia. Where and what is Southeast Asia? Southeast Asia is comprised of two major areas: part of the Asia mainland and the nearby Indonesian islands of Java and Sumatra. In the first millennium, the mainland region came to be dominated by three ethnic groups who eventually became the Vietnamese, the Cambodians, the Thai, and Burmese. Hinduism proceeded Buddhism in this region, especially among the ruling classes. Buddhism was introduced by the second or third century, but it did not become established until the fifth or sixth, mainly in the areas of Thailand and Burma. The earliest forms of Buddhist art were the bronze statues carried from India by monks and traders (for example, the statue of Avalokiteshvara discussed previously). The Gupta and post-Gupta artists of Bengal transmitted Mahayana Buddhist imagery to Indonesia. Monks and traders traveled back and forth between the two regions taking the scriptures and the votive statues from India to Indonesia. The ease with which Mahayana was accepted in Indonesia was due to the association of the ruler/king with a bodhisattva. The temporal authority of the ruler reinforces this concept. Indonesia (map of the region) is a nation in Southeast Asia comprised of roughly seventeen thousand islands. Indonesia has been an important trade destination since at least the seventh century, but trade with both India and China began as early as the first few centuries BCE. It was through contact with these two countries that Hinduism and Mahayana Buddhism were introduced, thriving from the eighth to the tenth centuries. During this period, the grand monuments such as Borobudur were built. The approach to Borobudur, c. 800, is from the east, which is the only staircase used to ascend the monument. The approach gets narrower closer to the top. [Is this reminiscent of any other religious/administrative buildings already examined in class? Perhaps a compare/contrast of Borobudur with a ziggurat.] Any staircase was used to go down. The reliefs on the lower level, which are now under the earth, depict the causes and effects of good and evil. The main, first, level contains two sub-levels. The lower illustrates five episodes from the former lives of the historic Buddha. The upper illustrates the jataka stories of the conception of his mother, Buddha’s birth, his four encounters with poverty, illness, death and aestheticism, the Enlightenment, and his first sermon at Deer Park. There are three phases of Buddhist development and decline in these areas. The first five hundred years were a period of development. By around year 1000, great Buddhist dynasties had been created in Indonesia, Thailand, and Burma (Myanmar). More Buddhist images have been produced in Burma than any other region in south-east Asia and no other country has produced more temples and stupas than Burma. The Cambodian Buddhist dynasties developed a bit later. The tenth to the fifteenth centuries marks the peak of Cambodian power and the waning of the Indonesian influence. Only in Thailand did Buddhist and Thai politics continue to flourish. Thailand and Burma are still the most viable Buddhist areas. Cambodia and southern Vietnam are still Buddhist, but the political situation makes them less visible. Similar to Indonesia, an important feature in Cambodia was the cult of the god-king. This was the conflation of the ruler with the deity, which served to elevate the king to semi-divine or even divine status. This practice was known in India, but this was also developed in Southeast Asia especially in Cambodia and Java. The portrait of the Cambodian King Jayavarman VII (twelfth–thirteenth century) captured both the physical likeness of the human king as well as the omnipotence and serenity of the bodhisattva Lokeshvara (a form of Avalokitesvara). What do the students notice about the facial features of Jayavarman VII? Does he look Indian? How does this image remind them of those of the Buddha? How do you think he wanted his people to think of him? Khmer and Thai portraits added jewels and a crown to the image of the Buddha, linking the subject with the concept of a universal monarch. How does this contradict the early histories of the Buddha, Buddhism, and images of the Buddha? Unlike in India where most of the sculptures were in relief (the steles), this area produced full three-dimensional images as early as the sixth century. Cambodia, just like Egypt and the Ancient Near East, is a hydraulic society, meaning that myths connected to water and the control of water are integral to the development of the country. The Mekong River is flooded annually by the melting of the snows in the Himalayas in Tibet. Managing the high water table was a considerable engineering feat in the construction of the primary Buddhist architectural structures in Cambodia. From the ninth through the fifteenth centuries, the Khmer were the ethnic group that made up the majority of the Cambodians, but knowledge of them is limited due to the lack of a written language. Also, since most of their objects found in the gravesites have been relocated to museums, it is difficult to tell by whom they were made and what was their purpose. The Khmer Empire was the largest in Southeast Asia, consisting of area of what is now Laos, Thailand, and southern Vietnam. It had close trade relations, and thus cultural and political ties, with Java. Angkor was the capital city during the empire’s height. (Angkor is now believed to be the largest pre-industrial urban center in the world.) At times, the Khmer empire’s official religions included Hinduism and Mahayana Buddhism. Those who are Buddhist in contemporary Cambodia now practice Theravada Buddhism (it was introduced from Sri Lanka in the thirteenth century). Water was important to the Khmer people—they were dependent upon water as the source of their livelihood, trade, and agriculture. Looking to the ancient Indic Vedic legends, the Khmers emphasized the naga (snake), the ruler of the underworld, and by extension, ruler of the water and fertility, who also served as a protector for the Buddha and the Khmer kings. An image of the Buddha with Muchalinda (protective water serpents) (twelfth century) with a halo was a common way to depict the Buddha in Cambodia. An aerial view of Angkor Wat with the canals clearly visible underscores the relationship of the Buddhist ideology with the ubiquitous water. The earliest inscriptions that survive date from the seventh century: 611 in Sanskrit and 613 in Khmer. The suffix attached to the rulers name (‘varman’ meaning “protected by”), however, was in use much earlier. Since it is a Sanskrit derivative it suggests that contact with India had occurred before hand. Since the most distinctive Khmer religious belief was the cult of the god-king as the center of the universe, this concept influenced the layout of temple complexes, with the primary shrine being the temple mountain, the center of the universe. 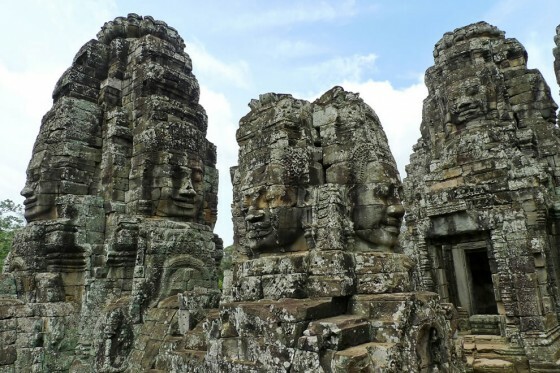 The grandest temples of this type are the Angkor Wat, a Hindu monument, and the nearby Buddhist structure, the Bayon, the focal point of the enormous Angkor Thom complex. The Cambodian shrines are elaborate arrangements of walls, moats and bridges surrounded by a raised platform usually with five towers to correspond to the five peaks of Mt. Meru. A single sanctuary dominated the shrines, housing cult images of deified ancestors (further linking the ruler and his family to the divine). Each monarch constructed a separate temple for himself, resulting in a continuous building program covering some 500 years that rivaled the building program of the ancient Egyptians. The construction of these complexes were also linked to economic needs. In Cambodia, the welfare of the society depended upon controlling the rivers through a system of extensive canal systems laid out with extreme accuracy. This emphasis on complex engineering concepts resulted in elaborate temples and remarkable hydraulic constructions, which enabled the civilization both to re-create the grand cosmic vision and to control and utilize the waterways for its agricultural requirements. Angkor is a region of Cambodia that served as the seat of the Khmer Empire, which flourished from approximately the ninth to the fifteenth centuries. The word Angkor is derived from Sanskrit meaning “city.” The Angkorian period began in 802, when the Khmer Hindu monarch Jayavarman II declared himself a “universal monarch” and “god-king.” The period ended in 1351. 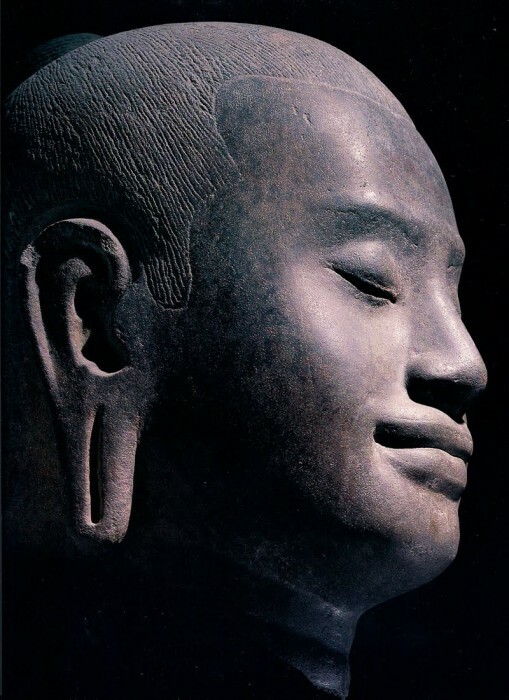 Jayavarman VII was the first of the Angkor kings to be a follower of Buddhism and he built the Bayon Temple in the center of the city as the symbol of Mt Meru, the symbol of the Buddhist cosmology. The Bayon is a Mahayana Buddhist temple dedicated to spreading compassion through the “three thousand worlds” of the universe. The Bayon style emphasizes the human basis of images of the gods, which may have been due to the cultivation of the persona of the king in a way that had not been attempted before. Traditionally, Jayavarmin VII’s face was conflated with that of the bodhisattva , Lokeshvara throughout the complex. Although, the identity of the faces has been subject to many theories: it could be Lokeshvara (a form of Avalokitesvara, bodhisattva) looking in the cardinal directions, which underscores the spreading of compassion through the “three thousand worlds” of the universe, and/or the king himself. Since Lokeshvara seems to have been central to the iconography throughout the kingdom, this interpretation seems likely. The reliefs depict battles between the Khmer and the Chams (the indigenous people of Cambodia and Viet Nam who predate the Khmer) as well as everyday activities of the people: markets, food preparation, fortunetellers, etc., demonstrating the rich lives of the people under the rule of Jayavarman VII. Reliefs throughout the complex also depict scenes from Hindu mythology and some contemporary episodes from Cambodian history. The Bayon is complex, mysterious, and was never finished. Originally there were said to be forty-nine towers, but many have fallen—an example of what is ultimately faulty engineering. Although made of sound materials with impressive drainage systems, the buildings have deteriorated due to the lack of stacking with vertical joints, not mortar, and being made of weak sandstone. The vertical pillars may have also exacerbated the pooling of water under the structure. *This engineering topic provides a great compare/contrast discussion with Machu Picchu, from Art of the Americas. Bayon, Angkor Thom, twelfth–thirteenth century. This would be a good opportunity to bring into class a discussion about the effects of tourism and looting on global art and architectural objects. In recent years, tourism has increased tenfold in Cambodia. New hotels and restaurants are built to accommodate such growth. Each new construction project drills underground to reach the water table, which has a limited storage capacity. This demand on the water table could undermine the stability of the sandy soils under the monuments at Angkor, leading to cracks, fissures, and collapses. Making matters worse, the peak tourist season corresponds with Cambodia’s dry season, which leads to excessive pumping of ground water. Why would tourism be both a benefit and a disaster? The increasing number of tourists, around two million per year, exerts pressure on the archaeological sites at Angkor by walking and climbing on the (mostly) sandstone monuments. This direct pressure by unchecked tourism is expected to cause significant damage to the monuments in the future. Ever since parts of the movie Tomb Raider was filmed there, the site has quickly decayed. Tourism is a vital part to the Cambodian economy, and shutting down parts of Angkor, the largest tourist destination in the country, is not an option. In addition, the Cambodian government has failed to organize a robust team of cultural specialists and archaeologists to service the site. What may save the site in the future is not in Cambodia at all. In the Indian state of Bihar, government wants to build an exact replica of Angkor Wat. While religiously, financially, and nationally this is controversial, it is perhaps the only chance of saving Angkor Wat for the future. Karen Shelby (author) is the co-founder of Art History Teaching Resources (AHTR) and an Assistant Professor of Art History at Baruch College. She specializes in nineteenth-century European art, early twentieth-century European and American art and teaches courses in nineteenth-century art, twentieth-century art, the art market, women and art, and Asian art.